In a report released in 2009 by Transportation for America, Raleigh, NC was ranked as the sixth most dangerous metropolitan area for pedestrians. Because it’s so hard to walk from Point A to Point B, our vehicles have become critical to our everyday lives. Raleigh is a commuter town, close to the Research Triangle Park, Durham and Chapel Hill — and there’s not a reliable means of mass public transportation. In short, we in the Triangle love our cars — and who can blame us? It’s because our cars are so important that we want to do everything we can to maximize their performance and protect them from breakdowns. 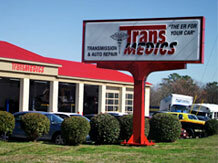 TransMedics, a leading North Raleigh auto shop can help you do just that. Our mechanics are some of the best in the business, proficient in administering the car repair and car maintenance services your vehicle needs to stay on the road. We’re also adept at handling the maintenance and repair needs of vehicle fleets for all kinds of commercial clients, including limousine companies, pest control providers and so much more! Why deal with the markups you’ll get at the dealership or the big chain auto shop? Visit TransMedics for quality car repair and maintenance work at competitive price points! Do you need an oil change, tune-up, engine check or A/C check? Drive to TransMedics in North Raleigh. Our mechanics help customers from just down the road and as far as Wake Forest, Rolesville, Knightdale, Durham and Cary.